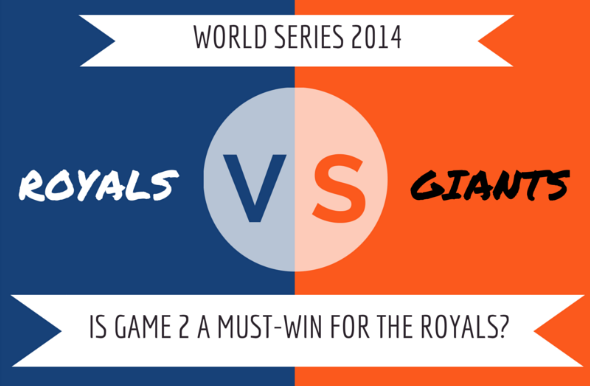 World Series 2014: Is Game 2 is a must-win for the Royals? The 2014 World Series began last night with Game 1 in Kansas City. After just five batters, the Giants already had a 3-0 lead and never looked back, taking a one game to none lead in the series. For the Royals, losing the first game of the World Series hurt, but would losing Game 2 be the death-blow to their chances of being crowned champions? No one wants to lose the first two games of a postseason series, but losing them on your home field hurts even more. The Royals have the home-field advantage in the series thanks to the American League’s win in this season’s All-Star Game (a ridiculous reason, but that’s a discussion for a different day), and if they lose Game 2, that will completely blow a great opportunity. San Francisco’s AT&T Stadium is one of the toughest stadiums to play in for a road team in Major League Baseball, and winning at least two games there would be a tough task. Since the league went to the 2-3-2 format for the World Series, there have been 13 teams that lost the first two games of the series at home. Of those teams, eight of them ended up getting swept and only three ended up going on to win the series. Those are not good odds. If the Royals don’t win tonight, odds are that they will not be champions this season. Now let’s hold on a second – if the Royals lose Game 2, that does not mean this series is over at all. For an example, the Royals and their fans can look no further than the city’s last postseason memory. Kansas City has not been in the postseason since their World Series winning team of 1985. In that season’s World Series versus the St. Louis Cardinals, the Royals were down two games to none after dropping the first two games at home in Royals Stadium. Led by George Brett and Bret Saberhagen, the Royals fought their way back, ultimately winning the series in seven games. The current Royals also have had the most magical run this season after such a long postseason drought, and a World Series victory would certainly be a storybook ending. As a sports fan, I make it a point to never bet against the best story; it always seems to find its way of becoming reality. Last reason not to count out the Royals? They were actually better on road this season than at home. They were 47-34 on the road, compared to just 42-39 at home. Their road record was the second-best in all of baseball. Some teams just feel very comfortable in other stadiums, and Kansas City is one of those teams. Obviously, the Royals and their fans don’t want to lose Game 2, but to count them out if they don’t win would be premature.